Hi, I am interested in your 1981 Chevrolet Corvette Coupe (stock #1337-NSH) listed on Autotrader for $14,995. I'd like to get more information about this vehicle and confirm its availability. This is a good-looking Corvette that has been well maintained and is a nice driving car. These C3s enjoyed a long run with many changes and improvements along the way, and this is among the last of them. This car is a great way to own one of these iconic American sports cars at very affordable price. Come on down and check it out. The last styling changes to this generation of Vettes was primarily done for aerodynamic reasons, but created a sharp new look in the process. Both the front and the rear bumper covers were revised with integrated spoilers that resulted in significant reductions in drag with the added benefit of increased air flow to the radiator for cooling through the enlarged intake grills up front. The hood was restyled as well with a long tapering power bulge leading to the base of the windshield and of-course there are the crossed racing flags leading the way on the nose. The Dark Blue Metallic paint this car is coated in works really well with the tinted T-Roof panels that can be lifted out for open air cruising, while toward the rear, the lines of the body flow down over the sloping rear glass and meet the high arch of the rear fenders as they bend back down to meet at the rear spoiler. Open the door and you will find a nice Blue interior that compliments the Dark Blue of the outside quite nicely. The door panel is simple stitched in vinyl with a long armrest with a carpeted lower section. Heavily contoured high back bucket seats are both comfortable and also hug you with substantial side bolsters that provide good support for spirited driving. A leather wrapped three-spoke steering wheel is mounted on a tilting and telescoping column and the shifter for the 4-speed manual transmission is just a flick of the wrist away in the center console. In front of the driver is a tach on the right and speedo on the left with the engine gauges in the center of the dash for fuel level, water temp, both oil pressure and oil temp, and battery voltage. Just below them is a Pioneer sound system for your listening pleasure and below that ventilation controls that include air-conditioning updated to R134. There is are a couple storage compartments behind the seats as well as cover for and room to stash the roof panels when they are out. Pop the hood and you will find a tried and true 350 cubic inch motor nestled down in the engine bay. There is a chrome air topper as well as a polished top on the master cylinder. Finned aluminum valve covers help a bit with oil cooling and look good while doing it. Power flows back through that 4-speed manual transmission to the rear wheels and the independent suspension sprung by a single transverse leaf. Up front unequal length control arms work with coil springs and a beefy front sway bar with new links and bushings as well as power steering to provide good handling and nice drivability. 4-wheel disc brakes will haul this car down from speed in a hurry if you decide to let the horses run and the rubber meets the road through 24560R15 white lettered tires all around mounted on factory alloy wheels. 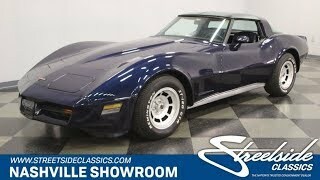 This is a good looking, stock, well maintained, nice driving Corvette. It is just looking for someone to go out and play with. Would that be you?